Mistakes That Will Damage Or Ruin Your Computer Motherboard: If we talk about computers, motherboard is one of the crucial components and is known as the heart of a computer. Here we will discuss the most common causes of motherboard failure. You can avoid these mistakes to take care of your motherboard. We all have a computer nowadays, those time are gone when computers are considered as a luxury. Computers are now a necessity. If we talk about computers, the motherboard is one of the crucial components and is known as the heart of a computer. The motherboard is the place where each and every part of a computer is connected, like a graphics card, Dvd drive, Hard disk all are plugged into the motherboard. So, it always becomes necessary to take proper care of the motherboard. Motherboards can also get damaged for numerous reasons, although there are a few common culprits. Here we will discuss the most common causes of motherboard failure. You can avoid these mistakes to take care of your motherboard. The most common reason why a motherboard fails is the heat. Almost every component of a computer is heat sensitive, and while all the components are operating it becomes quite hot as they produce a lot of heat themselves. If the heating problem continues over a time period, then it can lead to motherboard failure. Therefore, make sure all the cooling fans are working properly and store your CPU in a cool place. You can even try to clean out the dirt from the computer. In short, Motherboard conducts electricity and transfers it to other computer components, so it can’t come into close touch with any metal, like CPU chassis or any badly installed component. CPU coolers are the common reason for short circuits and often cause irreversible damage to motherboards. The best way to avoid short circuits is to examine how your motherboard is installed. You need to check whether all the internal wires are properly shielded with rubber or plastic exterior. Electrical spikes are the short-lived outburst of energy in an electrical circuit. You may have noticed the sudden change in voltage while turning on your air conditioners or refrigerators. This type of electricity problem can cause irreparable damage to the motherboard. Weather conditions like lightning cause a sudden change of voltage and this is what causes damage to the delicate circuits in your motherboard. So, to protect your motherboard from electrical spikes, use a good quality surge protector and turn off the computer/ unplug the computer during heavy lightning. These are the most common form of motherboard failure causes that very often happens to the motherboard during computer maintenance. Installing new peripheral devices, if the technician has static electricity built upon his/her hand, it can get into the motherboard, which leads to motherboard failure. If any of the component installed on your motherboard malfunction then your computer may not even turn on. Improper installation of RAM and graphics cards are most likely sources of your problems because problems in those areas are easy to neglect. Therefore, make sure to check each component are properly seated. Sometimes it hard to diagnose a damaged motherboard and sometimes it’s easy. But, if your computer is randomly powering down, or showing up a hardware error then it might be an indication of motherboard failure. Bad CPU can also damage your motherboard, sounds weird right? Well, the Central processing unit is connected to the motherboard. If you attach a badly damaged CPU with the motherboard, it can cause overheating issues. 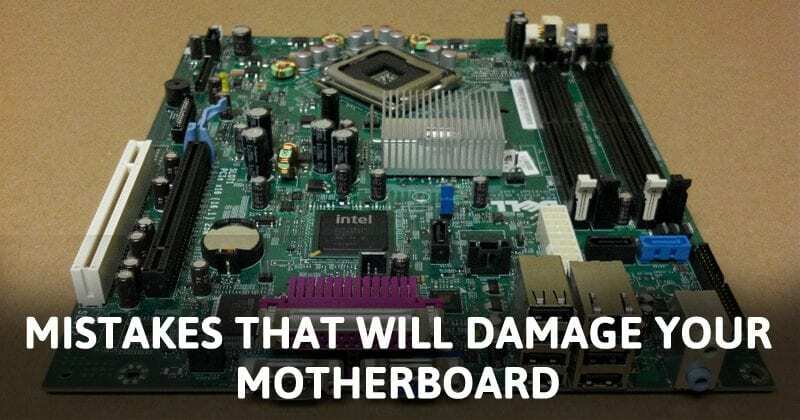 The results might not be immediate, but in the long run, it can damage the entire motherboard. You should also check the connection of the processor. Well, just like the CPU, your graphics card is connected to the motherboard. Graphics cards often get hot because of heavy gaming or intensive works like graphic designing. So, when our Graphics cards get hot, it directly affects the motherboard. It can even cause a short circuit, and your motherboard can also catch fire. So, if you feel that your graphics card is not appropriate for the motherboard, then don’t take the risk. When it comes to the electronic devices, dust is the common enemy. Dust causes the problem in the ventilation of your PC which in turns cause overheating. However, removing dust particles from the motherboard is not a straightforward process because you might end up damaging it. So, once every three months, make sure to take your computer to the nearest service center for dust removal. The reason why we have considered to bring your system to the service center is that they have the appropriate tools to remove dust without affecting the other things. Well, accidental spills are another thing which can cause severe damage to the motherboard. Almost every type of liquid can kill a motherboard instantly, but thicker liquids like milk turn out to be the worst. Actually, fluids cause the motherboard to short out, and you can’t fix it. Not just motherboard, liquid spills can also cause damage to different components of computer like the graphics card, RAM, Processor, etc. Well, cigarettes are not good for your health, and the same goes for computers as well. Computers and smoke don’t share any mutual friendship with each other, and it can damage your motherboard in no-time. Actually, it was the Tar from the cigarettes which creates problem inside a computer. Cigarette smokes when combined with dust particles forms a sticky substance inside a computer which is usually very difficult to remove. This tar and dust particles can cause overheating which can lead to motherboard failure. However, the damage won’t happen overnight, and it can be avoided by cleaning the interior of the computer.